This luxury vacation rental in Copacabana is one of a kind. Enjoy morning sunrises over Copacabana Beach, at your 11th floor, 3 bedroom apartment, in this quiet building. Peace and tranquility are in excess at this stylish vaction rental, where you feel like you're truly a local living the Rio lifestyle. 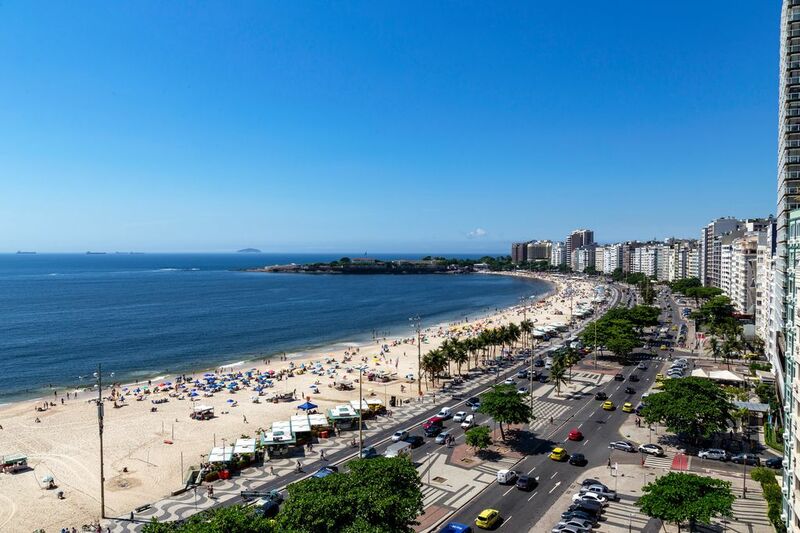 Copacabana Beach is one of the best known beaches in the world. You are ideally located close to Posto 5 along the beach, where the sand stretches wide and you'll be able to enjoy watching the Brazilians playing futevólei (volleyball with their feet), enjoy the ocean, or just lay in the sun. This vacation rental has everything that a group could want for their stay - air conditioning, fans, and 2 bathrooms. Along with iPod docking stations, and a living room with cable plasma tv and a dvd player. The floor throughout the vacation rental is comprised of large tile - great to feel cooler on those hot days. There is an open, American style kitchen, and the crowning glory of the unit is the large terrace (with outdoor furniture) for you to enjoy the incredible views from the comfort of your apartment. The best way to start the day in Rio is enjoying the amazing sunrises of Copacabana Beach and from the privacy of your own property. There is housekeeping 5 days per week, meaning you don't have to worry about a thing during your stay, and you can spend more time exploring the city, enjoying the terrace, or just living like a local on the beach for the duration of your stay.